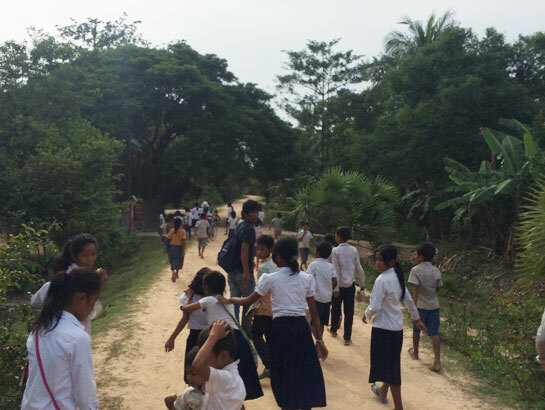 Meet Mr Sopheap, a teacher in a rural school outside of Siem Reap, Cambodia. 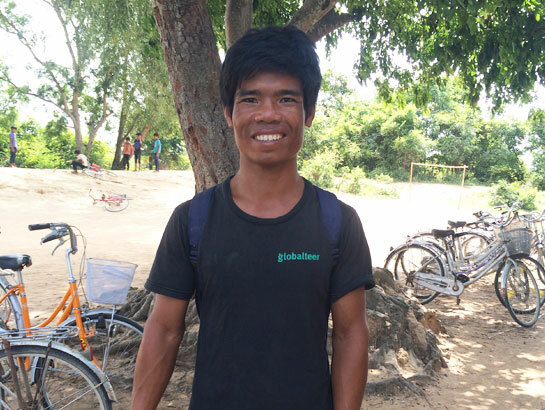 We met Sopheap through the Plastic Free July initiatives in Cambodia and we think he’s so fantastic we want to share his story with you. Sopheap lives around 25 km from Siem Reap. When he was young he would ride his bicycle into town every day so that he could go to school. This in itself shows the determination he had to learn. Now he’s a teacher and spends his day between two schools inspiring and teaching the children of his village. The first time we met, a mutual friend took me out to his house, we sat outside under a wooden shelter and talked about our passion for the environment, our friend patiently waited as we talked for hours. I was and still am inspired by what Sopheap has achieved. He is very humble about it and humble in his lifestyle that it warms my heart to know how much he gives to his community. Where Sopheap lives, the road is mostly clay. We’re now entering rainy season and this road is a nightmare in the wet weather. For the weeks leading up to rainy season, he has rallied the community to spend a little bit of time each Saturday morning to put some sand on top of the clay and top it up to help them through the wet weather. Then he gives them lunch in gratitude. He is working on a composting project and again, involves the community to share this knowledge and the fruit that it bears. And he is working on waste management, though there are few easy solutions at this time. Siem Reap only gained a waste management company in the last 12 or so months, step out of the town and there’s nothing. Yet, plastic wrapped snacks and drinks have easily made their way into the villages, leaving villagers with a bit of a mess and a big problem with how to dispose the waste. Despite this, Sopheap encourages the people in his village to separate items and keep the rubbish together and any opportunity he’ll send some back to town where it can be disposed of a little better than it can be in the village. 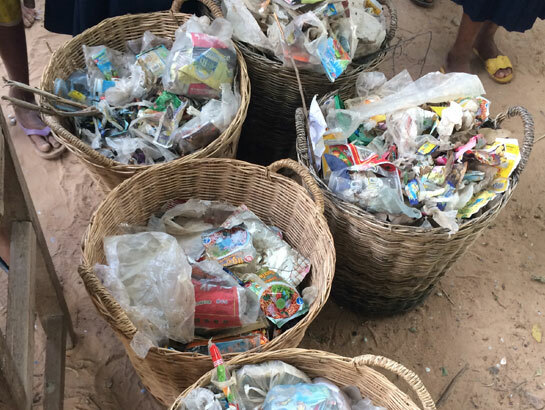 For a very long time Cambodians would burn their waste, which was fine when it was lotus and banana leaves… now that plastic has made it’s appearance the disposal methods haven’t changed but no one warned the Cambodian people of the perils of burning plastic… until now. Last week he invited me to visit his school and speak with the children. We started the session with a clean up around the schoolyard and neighbouring areas. 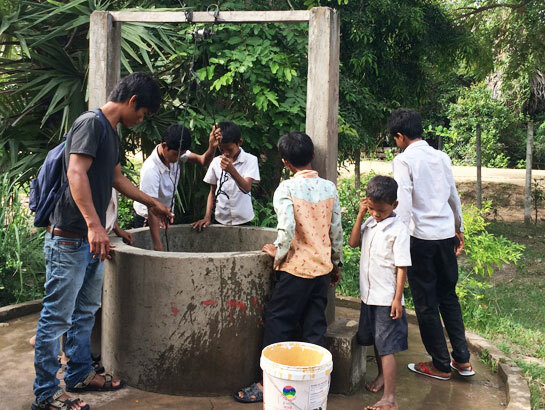 Then all children were industrious in washing their hands, great to see when personal hygiene is still lacking in many areas of Cambodia. There was so much enthusiasm in this process! We then sorted through the rubbish to see what the worst culprits were and we asked the kids what they thought too. We had a great discussion about plastic vs nature, how to use less plastic bags and water bottles and why it’s bad to burn plastic. The kids were interested and asked questions and will continue to learn from Sopheap in their regular classes. With Sopheap determined to teach his village about the issues of plastic, I’m honoured to be able to support and encourage and help in any small way I can. He already knows what needs to be done, but it’s always more fun with a friend. May I ask what they do with the plastic once they collected it? I run a small NGO with a project in the countryside. We support a community and school there. They produce only little waste compare to developed countries but also little waste has to be managed somehow. I couldn’t find another solution but burning it but I tought the people to burn it far away from the house/school. What is Sopheaps solution? At present he is working on getting people not to burn it and to collect it together. When he can he brings the rubbish to town where it can be collected by Gaea. It’s not ideal and it’s a difficult problem. We’ve talked about whether the same channels that bring the plastic into the countryside can be utilised to take it back to town again? And then there is the education on trying to use less. Less use means less waste. Most of the rubbish I’ve seen in the countryside is from sweets, lollies and biscuits, none of which are nutritional but they’re cheap… Burning the waste in a designated place away from people is a step up but it’s still sending all of those toxic gases into the atmosphere, so a viable solution needs to be found asap. 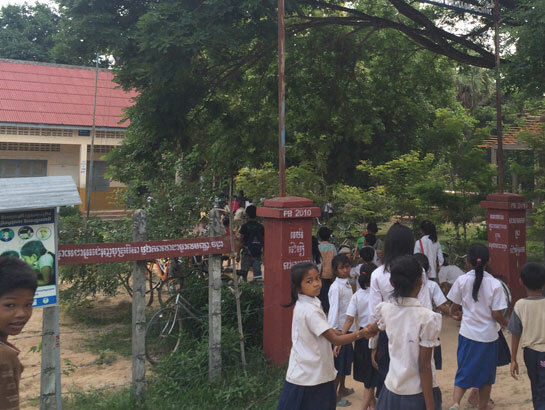 I admire Sopheap’s dedication to educate the people and try to find a solution. Cambodia needs more people like him and a solution found asap! Unfortunately, there is no town nearby the village I support so that we could take the rubbish there. I am also not sure if taking the rubbish back to the town really helps a lot with avoiding pollution from burning it. Don’t they just burn it at the garbage dump? Are you or others coming to Siem Reap sometimes? I would suggest bringing rubbish with you when you do. They don’t burn it at the garbage dump and it does help a lot by bringing it to the town. It’s not a perfect solution but it is still better than burning it. My village is hard to access and around 3.5 hours away from Battambang and 8 hours away from Siem Reap. I also usually come back on a moto and really can’t take rubbish with me on the hard trip over bumpy dirt roads. That is difficult, even if you can take a small amount that will help. The other thing that might be worth thinking about is, how is the plastic getting to Bech Khlok? Is it being supplied to small shops, villagers when they drive into town, etc then see if the suppliers can take some rubbish back, see if the villagers can help take responsibility for their trash. Thank you for the link to your site, it’s a lovely website and I will look forward to reading more about your project. It’s looking likely that PFJ will be in Battambang next month, so if you’ll be in town it would be lovely to meet up. If you are interested in my projects, here the link to the website: http://www.seedbeginnings.com. The remote village is called Bech Khlok.